March 2008 – © Angel Israel Achterbosch 2018 All rights reserved. My new niece decided to arrive here before I could reach her mother. She’s beautiful, of course. My sisters and I are all hovering over her while her daddy gets a few precious moments in between us. He’s a newbie, but he’s learning quickly. We on the other hand have many years of babying between us. Quick hands hold quivering legs, waving arms and neatly tuck them into a swaddling wrap where they can not escape to cause distress. Mouths are held just so to reach the nourishing milk. Open eyes are cooed to until they slip silently and blissfully back into REM. Here is a little spring baby for you! You can see that I found a little tree swing to be his “paradise view” in the cutout under his wing. 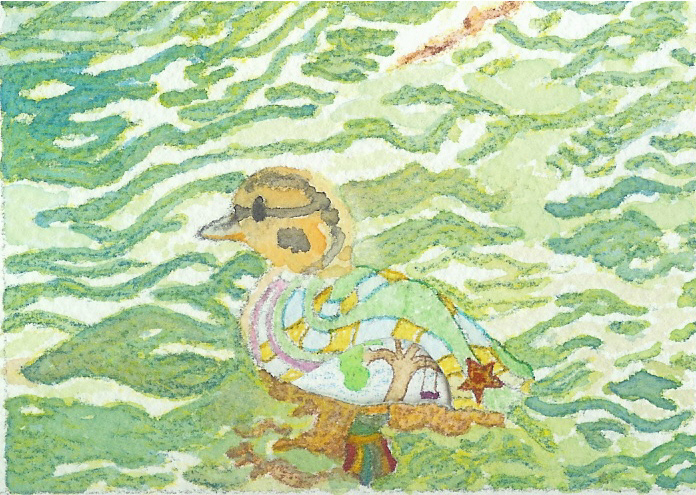 It will be posted on http://www.rosemoor.etsy.com sometime soon, my first Original ACEO to go up. I’ll let you know right before I do it, so make sure that you subscribe (on the left side of my vox page) if you are interested. I will be leaving on a plane tonight to take me far, far away to my sis and her first baby. She’s sooooo cute. I’m sure it will inspire more artwork so I’m packing up my paints and pencils. My baby and I went to Powells the other day. (VDP very dangerous place) for my visa card. After 30 minutes in front of the Asterix and Obelix and Tintin rounders, he was ready to go. I bought him off and bought myself 10 minutes in front of the art magazines. (It was SO worth it because I came away with the December issue of marie claire idees and Habitania.) I hummed happily on my way to sugar him up at a gellato shop. I’m so excited! Today I finished a new little creature. It is a baby creature and is trying to blend in quite a bit with his background. I am excited to see through his “window” but I can’t find my exacto blades at 12:30pm and I need to go to bed. So, I have to wait just like you do, for tomorrow. I’m always so curious to see “who” my little creatures really are, what their slice of paradise looks like. So, while we are waiting for them to emerge, write to me about your favorite surprises. I get surprises every day, most of them lovely. After my accident I had calls, emails, a girlfriend who registered me for classes, and a care package. (Always lovely!) I also had a friend who hunted down a favorite recipie of mine from another friend and made up a huge pot of salmon chowder. Yum! and so sweet. What surprises do you love? It’s easy for me to become so involved in the things I need to “do” that I forget to open my eyes to things going on around me. But I have little people in my house that bring me signs that spring and new growth are occurring. They brought me outside to see the freshness of what is happening right beyond my front door. 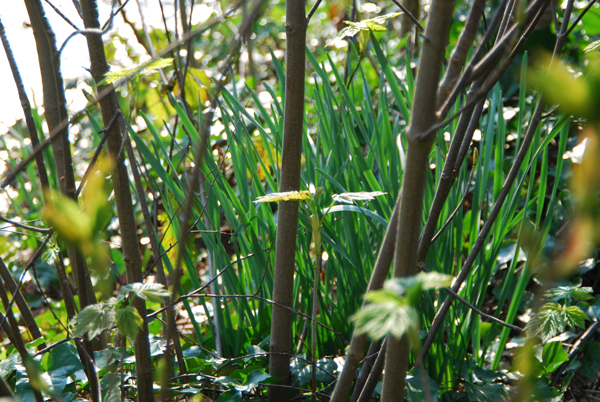 The first daffodils peeked their heads out at our house this week. What fresh greens appeared at yours? In my last post I asked you to send me the name of your current favorite animal. I’ve had two animals suggested so far, and I’m encouraging you to de-lurk and don’t be shy in telling me what your new favorite is! I’ve been working on the Valentines and they are ACEO size. (This means that they are 2 1/2 inches by 3 1/2 inches, a bit larger than a business card.) Right now elephants are figuring prominently in the artwork going on these cards. If you can inspire me with another animal suggestion, you may just see yours pop up in this mini size too. Author rosemoorPosted on March 7, 2008 March 31, 2018 Categories WonderlandTags aceo, art, springLeave a comment on Are you looking?